Audi has typically trailed its Teutonic rivals in the luxury-car sales race. However, as the 2014 Audi A8 illustrates, this sales ranking should not be construed as a reflection on the relative quality of the manufacturer's products. With a gorgeous cabin and handling that's distinctly and gloriously German, the A8 is, from roof to rubber, a class act that succeeds at elevating the driving experience in the large luxury sedan class. Audi tweaked the formula last year by revamping its engine lineup for the full-size A8. For the first time, base models were powered by a V6, and that switch has proven to be quite satisfying from a performance and efficiency standpoint. A new turbocharged V8 also debuted as a midlevel choice. Now for 2014 the engine lineup sees another change, with the addition of a 3.0-liter diesel V6. Performance is quite satisfactory, with a 0-60 mph time of 6.3 seconds along with fuel economy that's the most frugal in the high-end luxury sedan segment: 24 mpg city/36 mpg highway and 28 mpg combined. Within and without, the A8 embodies deluxe sophistication. The materials in its cabin are top-rate, and evidence of superior craftsmanship abounds. Typical of the large luxury sedan class, there are two wheelbases available, with the longer "L" model providing extra rear legroom. You can add further decadence to the rear seat with a variety of options, including massaging rear seats or an extendable footrest in W12 models. Other draws to the A8 include standard all-wheel drive and an extensive collection of luxury and technology-oriented features. Of course, most of these are traits that are shared by the A8's rivals, and selecting just one of these excellent luxury sedans is bound to be a challenge. Buyers with a yen for a sportier driving experience will want to check out the 2014 Porsche Panamera. If full-on luxury is more your thing, consider the sumptuous, all-new 2014 Mercedes-Benz S-Class. There's also the Jaguar XJ if you find the A8's styling a bit too anonymous, along with the BMW 7 Series, a perennial favorite even though it's now among the older models in this class. Still, despite fierce competition, the A8 is a great choice for buyers who appreciate understated opulence and a balanced approach to luxury and performance. 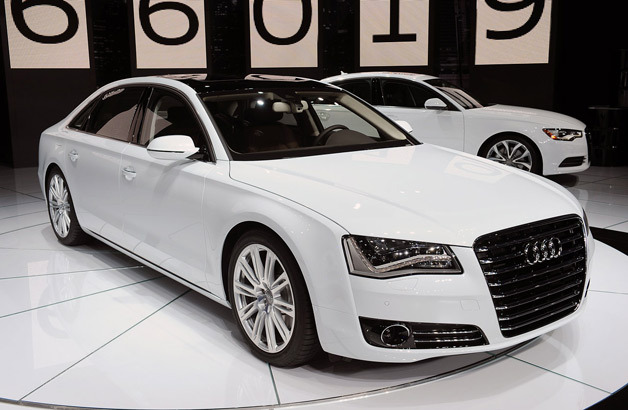 The 2014 Audi A8 Quattro is an all-wheel-drive luxury sedan that is offered in regular- and long-wheelbase versions, the latter identified by an L badge and bestowed with 5 extra inches of rear legroom. Trim levels include 3.0T, L 3.0T, L 3.0 TDI, 4.0T, L 4.0T and L W12. Each designation corresponds to the wheelbase and engine type. The high-performance Audi S8 is reviewed separately. Standard features for the base 3.0T include 19-inch wheels, adaptive xenon headlights, LED running lights, a sunroof, an adaptive air suspension, dual-zone automatic climate control, auto-dimming and power-folding mirrors, heated 12-way adjustable front seats with driver memory, a power tilt-and-telescoping steering wheel, aluminum and wood interior trim, a power rear sunshade, a power-operated trunk lid and soft-close doors. Electronic features in the cabin include keyless ignition, a navigation system, a rearview camera, Audi's MMI electronics interface with voice control, Bluetooth phone and audio connectivity, and a Bose surround-sound system with a CD player and an iPod interface. Also included is Audi Connect (enhanced Web-based navigation, information and Wifi access). Although the A8 3.0T is well equipped, there are a number of available options. With the Warm Weather package you get four-zone climate control along with power rear side-window sunshades. An Extended Leather package wraps the armrests, center console and steering wheel airbag cap in leather. On the long-wheelbase L 3.0T model, the Warm Weather package, Extended Leather package and piano-black interior inlays are included as standard. To either wheelbase, 3.0T buyers may choose to add the Premium package, which includes 22-way multicontour comfort front seats with ventilation and pneumatic massage, full LED headlights, a blind-spot warning system and a rear collision-mitigation system. A Cold Weather package adds a heated steering wheel, a ski bag for the rear seat pass-through and heated rear seats. A Luxury package includes a faux-suede headliner, upgraded leather upholstery and dual-pane glass. The Rear Seat Comfort Plus package includes a five-passenger configuration with separate power rear outboard seats with ventilation and massage, and front passenger seat adjustment from the rear seat. For a sportier A8, the Sport Plus package applies a sport-tuned air suspension, adaptive steering and a rear limited-slip differential. Finally, the Driver Assistance package includes a top-view parking camera system; adaptive cruise control; a lane-departure warning system; the more deluxe Pre-Sense Plus version of Audi's collision warning and braking system; and automatic high-beam control. Stand-alone options include a panoramic sunroof, a solar sunroof (powers a ventilation fan to keep the car cool), a premium Bang & Olufsen sound system, a night vision camera (an infrared camera to detect animals and pedestrians up to 1,000 feet away) and a rear seat entertainment system (with two 10-inch headrest-mounted screens). The 4.0T model has the same standard equipment as the 3.0T model, save for the addition of active noise-cancellation technology (included to compensate for its V8 engine's cylinder deactivation system), while the L TDI and L 4.0T are equipped like the L 3.0T. These models also feature optional equipment similar to the 3.0T models, but are additionally offered with an Audi Design Selection package that adds full leather upholstery, dual-pane glass, unique stitching and piping, an Alcantara headliner and unique wood and aluminum interior trim elements. The prestige-level L W12 is essentially a fully loaded, four-seat version of the long-wheelbase model that is powered by a 12-cylinder engine. It includes all of the above-listed features, except for adaptive cruise control (and the more advanced collision avoidance system that comes with it), the solar sunroof, premium Bang & Olufsen audio and the night vision camera -- all of which remain stand-alone options. Also note that the 2014 Audi A8 L W12 rolls on 20-inch wheels and comes with standard adaptive steering. Optional is the Executive Rear Seat Comfort package. It includes one rear relaxation seat with a powered footrest, a 10-way power front passenger seat, a refrigerated cooler box and a 115-volt power outlet. There's also the W12 Driver Assistance package, which includes adaptive cruise control, a lane-departure warning system and a collision warning and braking system. Other option packages for the W12 include the W12 Sport package (sport suspension plus the limited-slip differential) and the Audi Design Selection package. Powering the base model 2014 Audi A8 is a supercharged 3.0-liter V6 that produces 333 horsepower and 325 pound-feet of torque. All of this power is channeled through an eight-speed automatic transmission and all-wheel drive. In Edmunds testing, a long-wheelbase L 3.0T with the optional Sport Plus package accelerated from zero to 60 mph in 5.3 seconds, which is quicker than every V6-powered competitor and just off the pace of those packing V8s. Also standard on the V6 is an automatic stop-start feature that shuts the engine off when the car comes to a stop. It helps to increase fuel economy, which is quite good for this class of car at an EPA-estimated 18 mpg city/28 mpg highway and 21 mpg in combined driving for either wheelbase. Newly added this year is a 3.0-liter turbodiesel V6 engine rated at 240 hp and 406 lb-ft of torque. In our testing, an A8 TDI took 6.3 seconds to accelerate to 60 mph. At 24 mpg city/36 mpg highway and 28 mpg combined, fuel economy with this engine is exceptional, and the engine comes only with the long-wheelbase configuration. The turbocharged 4.0-liter V8 produces 420 hp and 444 lb-ft of torque. Stop-start, an eight-speed transmission and all-wheel drive are also standard. In Edmunds testing, an A8 L 4.0T ran to 60 mph in just 4.2 seconds. The EPA estimates the 4.0T should earn 17 mpg city/28 mpg highway and 21 mpg combined, or nearly the same as the supercharged V6. The L 4.0T is only slightly more thirsty at 16/26/19 mpg. Audi A8s with the 6.3-liter W12 engine come only in long-wheelbase configuration. The 12-cylinder engine makes 500 hp and 463 lb-ft of torque. As with all A8s, an eight-speed automatic and all-wheel drive are standard. Weighing in about 200 pounds more than the L 4.0T, the A8 L W12 will reach 60 mph in 4.4 seconds, according to Audi. The EPA estimates fuel economy at 13/21/16 mpg. Standard safety equipment for every 2014 Audi A8 includes antilock brakes, stability and traction control, full-length side curtain airbags, front and rear seat side airbags and active front headrests. A rearview camera is standard on most A8s, while the W12 gets an enhanced camera array with a top-view display (optional on lesser models). A blind-spot monitor and lane-departure warning system are offered in a couple of available option packages. Also optional is Pre-Sense Plus, which uses the adaptive cruise control system's radar to monitor traffic and alerts the driver if a potential collision is detected, even applying the brakes (to a standstill when vehicle speed is below 20 mph). A night-vision camera is a stand-alone option. In Edmunds brake testing of a V6-powered A8 with optional summer tires, the car came to a stop from 60 mph in an impressively short 104 feet. With the same tires, the TDI model needed only 109 feet. An A8 3.0T with all-season tires delivered us to a stop in 121 feet, which is average for similarly equipped cars in the class. An A8 L 4.0T with all-season tires came to a stop from 60 mph in 114 feet. As Audi's flagship, the 2014 A8 represents the best that the company has to offer. Thanks to exquisite materials combined with impeccable craftsmanship, the cabin is one of the finest in any flagship luxury sedan. As you'd expect, comfort is a priority and the A8 delivers it in heaping portions. The upgraded seats found in the Premium package adjust in so many ways that Audi needed to invent a more advanced means of controlling them, and they ultimately ensure that drivers of any size or shape will find an optimal position to motor away countless miles. Rear seat comfort is also noteworthy, especially in the long-wheelbase versions that provide an expansive 43 inches of rear legroom. For technophiles, Audi's Multi Media Interface provides a long list of functions through a crystal-clear display. There's a bit of a learning curve to it, but with a little time, control of numerous systems becomes second nature. The unique remote touchpad (upon which you can "write" numbers and letters with your finger) also doubles as a radio preset panel. It may seem like a superfluous novelty at first, but it turns out to be as useful as it is cool. If there's one complaint that seems to come up more than others, it would be the A8's lack of trunk space. At a paltry 13.2 cubic feet, cargo capacity is far below that of its competitors and not nearly adequate to accommodate luggage for four adults. Power from the Audi A8's base V6 is plentiful, whether under acceleration or cruising down the highway. Passing slower cars is effortless and the brakes are equally up to the task of bringing the big sedan to a halt. The 4.0T power plant is even more impressive. While earning nearly the same fuel economy as the supercharged V6, the turbo V8 delivers a tidal wave of effortless torque to the point that a V8-equipped A8 will go toe to toe with almost any muscle car in a drag race. Fortunately, there are few if any drawbacks to making the switch to the diesel-powered A8 TDI model. Acceleration is brisk thanks to the plentiful torque, and there's very little diesel clatter to be heard from the inside. The automatic stop-start function can be a little jarring on startup, but it is quick to react and requires no waiting to get back on the gas. For those who find it too disruptive, it can be disabled easily. With its all-wheel drive, well-tuned suspension and crisp steering response, the A8 handles like a smaller, lighter sport sedan in either wheelbase configuration. Yet over broken pavement, the Audi flagship delivers a compliant, composed ride fully in keeping with its luxury sedan status. We also like its electronically adjustable settings for the chassis and engine calibration, which provide a much greater degree of driver customization than BMW's similar system. All things considered, the 2014 Audi A8 is a worthy competitor among world-class luxury sedans. While the gap between these high-end sedans is narrow, the Audi A8 distinguishes itself as a bona fide driver's car.